Memorials of World War II – Bliss Travel Inc.
* For bookings made after 11/18/2018 call for rates. Welcome to London! 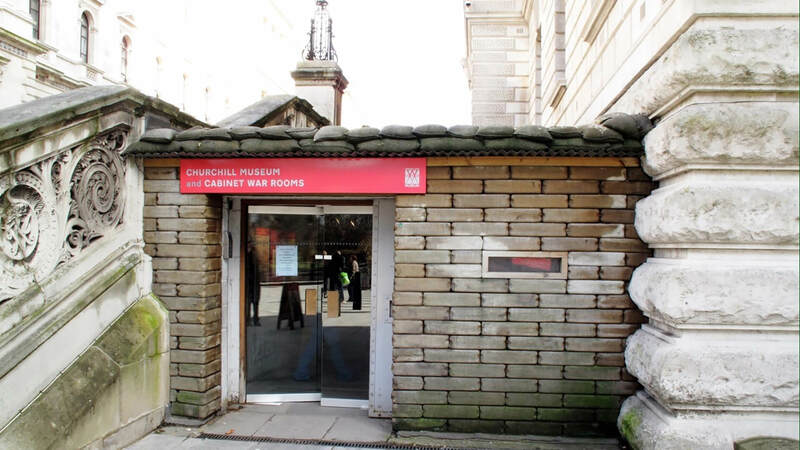 Discover the city’s rich historical relationship with World War II. This evening dine amongst history as you meet your fellow travelers for dinner in the iconic Borough Market. 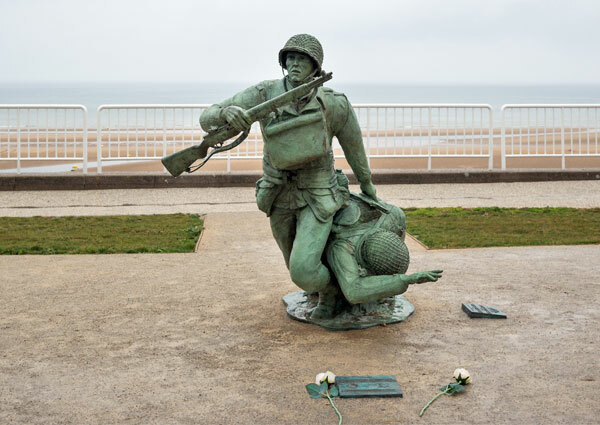 Immerse yourself in the history of Normandy’s beaches – the site of the largest amphibious invasion in history. 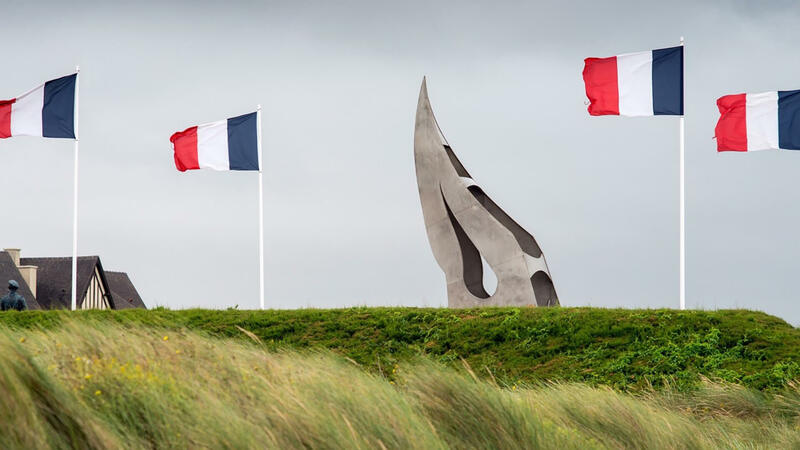 Visit Juno and Sword Beach, where Canadian and British soldiers sacrificed their lives among a deluge of air attacks, naval bombardments, and land offenses. Continue on to Arromanche-les-Bains to view the Mulberry Harbor, one of the greatest engineering feats of WWII and a massive coup for the Allies. 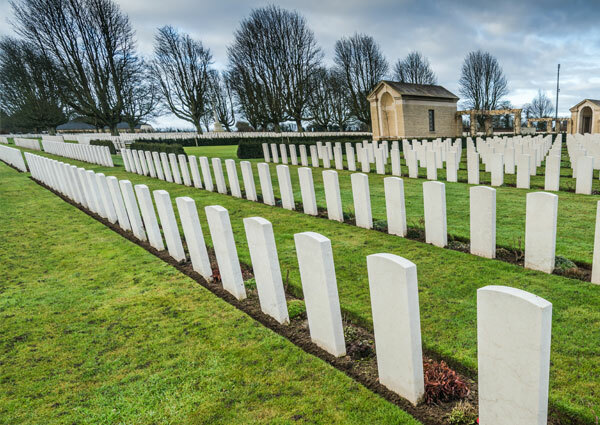 Visit the Bayeux Cemetery and Memorial – the largest WWII cemetery of Commonwealth soldiers in France. Pay respect to the 1,800 men of the Commonwealth land forces that perished and have no known grave. 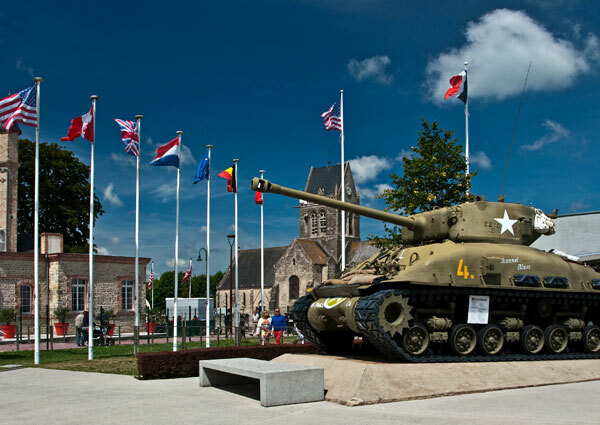 Next, explore the Memorial de Caen (Peace Museum) dedicated to providing a comprehensive history of the D-Day landings and Europe’s post-war transition. Set out for the Normandy American Cemetery and visit the cemetery grounds, the memorial, and the visitor’s center. Visit two U.S. landing zones of the invasion of Normandy: Omaha Beach and this afternoon, Utah Beach. Discover Pointe du Hoc, a strategic German battery that defended Utah and Omaha beaches from the Allied invasion, where craters from cataclysmic bombings occupy the landscape to this day. 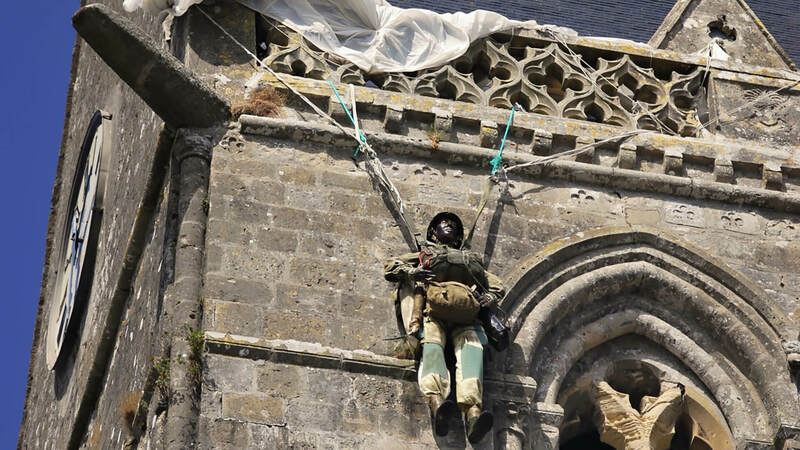 At the Airborne Museum, learn the unique history of paratroopers in the city of Saint-Mère-Église. Step into the formal world of the British Monarchy when you visit the stately and expansive Windsor Castle. Her Majesty Queen Elizabeth II uses Windsor as both a private home and as a Royal residence where formal duties of state are performed. Windsor’s 1,000 rooms comprise the largest inhabited castle in the world. It dates back to the 1070s, when William the Conqueror built the original wooden structure, now replaced by the grand stone edifices. Explore one of Britain’s most visited historic buildings, its precincts, and the State Apartments, which house a delightful collection of Royal art treasures. Enjoy time for lunch in the quaint town of Windsor before heading back to London. This once-in-a-lifetime opportunity to visit the castle that houses so much British history and lore is not to be missed! Duration: Approximately 4.5 hours. Please note a minimum of 15 passengers is required. Transportation is included. Join us for a guided tour of the world-renowned Louvre Museum. Begin your exploration of the museum by entering through I. M. Pei’s famous Louvre Pyramid, a magnificent glass pyramid rising out of the courtyard of the Louvre. A local expert will provide commentary as you venture through the countless masterpieces that line the halls of the museum, including the Venus de Milo and the Mona Lisa. This option must be purchased and reserved no later than 30 days prior to tour departure date. It may not be available for purchase while on tour. The Louvre Museum option is not available on the first Sunday of each month. Space is limited on some date Duration: Approximately 3 hours. Please note a minimum of 20 passengers is required. Transportation is included. This is your night! Your evening begins with dinner at a traditional restaurant, tucked away in the medieval streets of the Latin Quarter. Enjoy a French feast with unlimited wine accompanied by the strains of local musicians. As you bask in the warm hospitable glow, sit back, relax and soak up some authentic French culture. Complete your experience at Montparnasse Tower, the tallest skyscraper in Paris. Ascend to the 56th floor viewing level and head outside to the open roof terrace for an unrivaled view of the city. From this magical vantage point you will surely understand how Paris came by its name “The City of Light.” Duration: Approximately 4.5 hours. Please note a minimum of 20 passengers is required. Transportation is included. Our industry-leading cancellation waiver offers travelers a full cash refund for the price of the tour, right up to the day prior to departure, minus the small cost of the waiver. Travel worry-free knowing if anything changes, you’re protected. Plus, you’re covered on tour. Our cancellation waiver and insurance plan covers you on tour. If you have to stop your trip or return home early, need medical assistance or evacuation, suffer a baggage loss or delay; or are delayed on tour for 12 hours or more, you’re covered. Cancellation Waiver and Insurance is just $315 per person. Contact Jamie Lambert for more details. Book Now rates valid until Nov 18, 2018, valid on air inclusive packages only. Please be advised many airlines do not provide advance seat assignments until check-in at the airport. Advance seating will be subject to the airline’s terms and conditions. Cancellation Charges for this tour: After your seat reduction date has passed, a non-refundable deposit will be retained. For Cancellation between 60-16 days prior to departure: cancellation fee of 30% of total price. For cancellation between 15-1 days prior to departure: cancellation fee of 50% of total price. For cancellation on the day of departure and after: 100% of total price. For Ocean Cruises: For cancellation between 90-61 days prior to departure: cancellation fee of 35% of total price. For cancellation between 60-31 days prior to departure: 60% of total price. 30 or fewer days prior to departure: 100% of total price. For River Cruises: including Europe, Russia, Egypt and China, 90-61 days prior to departure: cancellation fee of 50% of total price. For cancellation between 60-31 days prior to departure: cancellation fee of 85% of total price. For cancellation 30 or fewer days prior to departure: cancellation fee of 100% of total price. For Galapagos and Antarctica: A cancellation fee of 60% will apply for cancellation between 120-90 days prior to departure; A cancellation charge of 100% will apply for cancellation less than 90 days prior to departure. Cancellation protection is highly recommended and must be purchased at time of deposit. Air rates are subject to change until tour is paid in full. If Travel Protection Plan has not been purchased and a reservation is cancelled for any reason prior to departure – Air is 100% non-refundable once paid in full. Cancellation charges also apply to reservations made for “pre” and “post” night accommodations. Payment of a Per Person Travel Protection Plan Fee guarantees a full refund of all payments (including deposit), except the Travel Protection Plan Fee itself, made to Collette for travel arrangements in case of cancellation of your travel plans for any reason prior to the day of departure. The Travel Protection Plan Fee with Air only covers airline tickets you have purchased from Collette. Exception: If you originally purchased nonrefundable airline tickets, Part B of the Travel Protection Plan may provide a refund for the airline tickets, taxes, or fees in the event of a cancellation for a covered reason (see Part B for more details). The Travel Protection Plan Fee does not cover any single supplement charges which arise from an individual’s traveling companion electing to cancel for any reason prior to departure. However, the Part B travel insurance includes a single supplement benefit of $1,000 for certain covered reasons as detailed in Part B. In this case, the single supplement will be deducted from the refund of the person who cancels. Division of this charge between the two passengers involved is solely their responsibility. If insufficient funds are deducted from the canceling client, the traveling client will be charged the remaining portion of the single supplement. Cancellation waiver protects you from penalties in the event you have a need to cancel your entire inclusive tour package up to the day prior to departure. Cancellation waiver does not indemnify you from penalties if you chose to cancel partial tour components or air. If you chose to partially cancel your vacation, you will be responsible for a revision fee as well as any penalties that are incurred at the time of the cancellation. Upon cancellation of transportation or travel services where you, the customer, are not at fault and have not canceled in violation of the terms and conditions above, you will be refunded 100%. Please see your sales agent for more information, or review our brochure for details. Consumer Protection Plans: Collette Travel Service holds membership in the following highly reputable industry organizations: the United States Tour Operators Association and the American Society of Travel Agents. Each association operates a consumer protection plan to cover deposits made by travelers. Full details are available from the organizations or Collette Travel Service. Collette is pleased to give this additional protection to our clients. Our California Sellers of Travel registration number is 2006766-20. Our State of Washington Unified Business Number is 601220855. Our Nevada Sellers of Travel registration number is 2003-0279. IDENTIFICATION Passports are required for this tour at your expense. Certain countries require a minimum of 6 months passport validity from date of return home. You are strongly urged to contact the appropriate consulate for details. Visit www.travel.state.gov for the U.S. State Department for the latest details about passports and visa requirements. IMPORTANT: We recommend that our clients traveling abroad take a photocopy of their passport and applicable visas. It should be packed separately from your actual passport and visa. We also recommend leaving a copy at home with your emergency contact. Responsibilities: Neither Collette Travel Services, Inc., its affiliated entities and its and their employees, shareholders, officers, directors, successors, agents, and assigns (collectively “Collette”), own or operate any person or entity which is to or does provide goods or services for these trips. Because Collette does not maintain control or operate the personnel, equipment, or operations of the suppliers it uses and as such Collette assumes no responsibility for and cannot be held liable for any personal injury, death, property damage or other loss accident, delay, inconvenience, or irregularity which may be occasioned by reason of (1) any wrongful, negligent, willful or unauthorized acts or omissions on the part of any of the suppliers or other employees or agents; (2) any defect in or failure of any vehicle, equipment, or instrument owned, operated or otherwise used by any of these suppliers; or (3) any wrongful, willful or negligent act of or omission on the part of any other party not under the supervision and control of Collette. Additionally, Collette waives any and all liability for losses or expenses due to sickness, lack of appropriate medical facilities or practitioners, weather, strikes, theft or other criminal acts, war, terrorism, computer problems, acts of God, or other such causes. All services and accommodations are subject to the laws of the country in which they are provided. 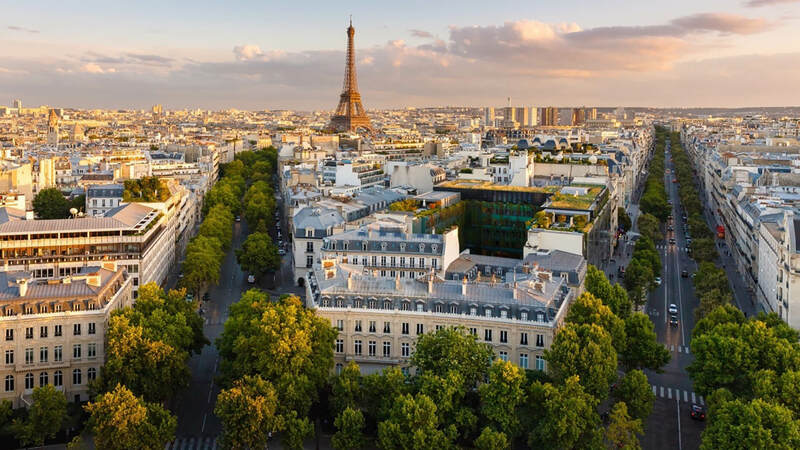 Collette reserves the right to make changes in the published itinerary whenever, in their sole judgment, conditions warrant, or if Collette deems it necessary for the comfort, convenience, or the safety of the tour. Collette reserves the right to withdraw any tour at any time. Collette reserves the right to decline to accept any person as a member of the tour, or to require any participant to withdraw from the tour at any time, when such action is determined by the tour manager to be in the best interests of the health, safety, and general welfare of the tour group or of the individual participant. Collette does not accept liability for any carrier’s cancellation penalty incurred by the purchase of a non-refundable airline or other ticket to the tour departure city and return or otherwise. Baggage and personal effects are the sole responsibility of the passenger at all times. Passengers may be photographed for the promotional purposes of Collette. Payment of the deposit to Collette constitutes acceptance of these terms and conditions. I agree that any dispute concerning, relating, or referring to this contract, the brochure or any other literature concerning my trip, or the trip itself, shall be resolved exclusively by binding arbitration according to the then existing rules of the American Arbitration Association in the State of Rhode Island. Such proceedings will be governed by and in accordance with substantive Rhode Island law. The arbitrator and not any federal, state, or local court or agency shall have exclusive authority to resolve any dispute relating to the interpretation, applicability, enforceability, conscionability, or formation of this contract, including but not limited to any claim that all or any part of this contract is void or voidable. Explorations is a brand of Collette Travel Services Inc., a Rhode Island based corporation. *Airfare: For your convenience, we offer airfare for purchase with all vacation packages. If you purchase an air inclusive program, your airfare will be quoted inclusive of all fuel, taxes and fees. Your rates are subject to change until paid in full. Seats are limited and may not be available on every flight or departure date. Checked Baggage Charges: Some airlines may impose additional charges if you choose to check any baggage. Please contact your airline or refer to its website for detailed information regarding your airline’s checked baggage policies.